Tui T. Sutherland is one of the authors who created the Warriors and Seekers series of cat-fantasy novels under the collective pseudonym of Erin Hunter. 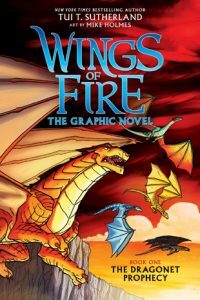 You may recall we reviewed her novel series Wings of Fire previously. Well recently Scholastic requested the author to help in adapting that series into a graphic novel, which has been released by Graphix. “Not every dragonet wants a destiny . . . Clay has grown up under the mountain, chosen along with four other dragonets to fulfill a mysterious prophecy and end the war between the dragon tribes of Pyrrhia. He’s not so sure about the prophecy part, but Clay can’t imagine not living with the other dragonets; they’re his best friends. So when one of the dragonets is threatened, all five spring into action. Together, they will choose freedom over fate — on their own terms.” With full-color art by Mike Holmes, Wings of Fire: The Graphic Novel is available now.